On April 12, 1931, the country held elections for its municipal councilors; the vote was heavy, reaching 90 per cent in many places; there were no disorders of any kind, and when the final count was made it caught both sides by surprise. The vote revealed that every capital city of the fifty provinces of Spain, with four minor exceptions, had voted for an antimonarchy state. In Madrid and Barcelona the Republican landside was overwhelming. The king was told that his reign was over, and was advised to leave Spain, which he promptly did, without, however abdicating his throne. The Civil Guards Corps came over to the Republicans, and on April 14, 1931 the Republic was declared. The actual tally of all votes cast in the municipal elections indicated that the monarchists were far from dead. The result still indicates a monarchist strength of about 40 per cent of the electorate. In the campaign of 1931 many churchmen had referred to the Republicans as “communists,” hoping thus to bring about their defeat at the polls and barely four weeks after the declaration of the Republic, the archbishop of Toledo issued a pastoral letter casting suspicion on the new regime, and referring to the Republican victory at the polls as the triumph of “the enemies of the Kingdom of Jesus Christ.” Other bishops were more moderate in their views, and hundreds of parish priests had voted Republican in the elections, but the primate of the Spanish church thus loudly and publicly aligned himself with the forces of reaction. Three days later the mobs began to attack the churches. The riots started in Madrid and spread like wildfire throughout Spain, becoming particularly violent in Andalusia, the region of greatest poverty. Many of the vandals and arsonists were from the atheistic far left, but others were almost undoubtedly paid agents of the royalists. Over one hundred churches were gutted by flames. Communism now became a much used word, and the blissful enthusiasm of the first days of the Republic began to settle into a feeling of serious concern. The Republic was certainly the product of intellectuals. The Cortes proceeded to draw up a new and idealistic constitution. “Spain is a country of all classes,” this document proudly proclaimed. 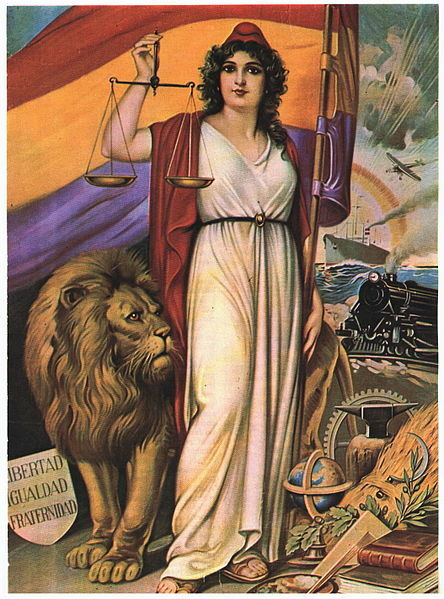 It provided for universal suffrage, a one-chambered parliament, separation of church and state, freedom of worship, withdrawal of financial support of the clergy, the secularization of education, agrarian reform to be made possible by the expropriation of private property, and many other items of progressive legislation. Idealistically inspired, quixotically stated, the new constitution was a beautiful paper dream. It promised more than any Spanish government could possibly deliver. Despite all encumbrances the Republic, during its first two years, struggled courageously with the task of transforming an almost medieval country long accustomed to absolutism into a modern nation with a progressive parliamentary government. The problem of education was attacked with messianic zeal. The first Minister of Education created three thousand new schools; the second added seven thousands to this already startling total. The new constitution proclaimed “compulsory education,” but as there were barely enough schools for one-fourth of the school population, these were idle words. Besides, not all of the new schools were properly manned. Yet the widespread public desire to be educated had become almost an obsession; this was perhaps the Republic’s greatest achievement. The crux of the most violent hatred aroused in Spain by the liberal Republic was the religious problem. The church had always officially opposed liberalism, and Spanish liberals had almost invariably opposed the church. Manuel Azaña, the most respected leader of the Republicans, proclaimed at the time that the most vigorous anticlerical action was inevitable. The anticlerical campaign resulted in the following items being embodied in the new Spanish constitution or in special statutes enacted shortly afterward: separation of church and state, divorce to be permitted after two years of marriage by mutual consent, secularization of education, disbanding of the Jesuit order and confiscation of Jesuit property, secularization of all cemeteries and prohibition of religious burial unless the deceased had specifically requested it in his will, absolute freedom of worship for all cults, withdrawal of all state financial support of the clergy within two years. While the dogmatic resolution of the religious question in Spain was probably the strongest cause of the downfall of the Republic, the manner in which the land problem was handled was also a great disappointment. The Spanish civil service was notably lacking in trained personnel to carry out the far-reaching agrarian reform program, or any other kind of social or political reform. While they dreamed, the Republican parliament was compounding its mistakes, and the conservative opposition was consolidating and compounding its resistance. When the elections of 1933 took place the Spanish Republic moved abruptly toward the right. The votes of approximately six million women, enjoying suffrage for the first time, perhaps helped to account for the change in sentiment. Almost at once all of the liberal legislation of the first two years of the Republic was either repealed or became a dead letter. The suddenness of the swing proved beyond a doubt that the single chamber of the Spanish Cortes was a serious political error. Had there been an upper senatorial chamber to counterbalance the rapid change in sentiments of the electorate the situation would have been vastly more stable. Lacking this stabilizing force the government ran headlong into difficulties which it could not properly handle. Finally, in 1936, new elections were held, and these were considered a great victory for the coalition of the left, who had consolidated their ranks in what was known as the Popular Front. The people of Spain had clearly voted in favor of moderation, and in favor of a continuation of the Republic. But at this point in the country’s history the two extremes took over completely, and moderation and compromise no longer seemed possible. The very popular Manuel Azaña became President, but even he was powerless to stop the avalanche. Unfortunately, as president he had less power than as Prime Minister. The presidency was a decorative position, and the real governing was left to others. The loss of Azaña’s steadying hand was a great blow to the republic. On the far left Largo Caballero and his extremist companions plotted a revolt, and on the far right Francisco Franco and his colleagues made their plans for a military uprising to take over the government. The latter broke out before the former could get under way, and thus began the Spanish civil war. As the two extremes consolidated their positions the country suffered a series of riots, assassinations, reprisals, strikes, attacks on religious buildings and personnel, and general bedlam. The central government, now in the hands of the Popular Front, was unable to keep order. On July 17, 1936, the rightist revolt started, and the army of Morocco was brought into Spain to spearhead the attack. The uprising broke out on the mainland the following day. True, the majority of the people of Spain voted for moderation, but about one tenth of them supported the extreme left, and at least another tenth of them, supported the extreme right. Their leaders at both of these extremes, fired to a great pitch of passion by such evidence of popular support, charged blindly ahead without so much as a good look to see who was following them, or what was happening to their country. The Spanish people were clearly sacrificed on the altar of this struggle for power. The mistakes of the Republic are not difficult to point out with the advantage of hindsight. In the first place, the constitution was far too idealistic, and was not flexible enough to adapt to the necessities of the epoch. The workers and labor unions, especially the anarchists and the left-wing socialists, and of course, the communists, provoked numerous needless strikes and fomented numerous stupid killings and disorders, thus frightening a large segment of the population and stirring up sentiment against the Republic. The extreme right, imbibed with fascist ideas from Italy and Germany, was equally violent and lawless. The entire right was undoubtedly anxious to control the Cortes, but its political leaders were not willing to initiate a fascist revolt. This task was undertaken by the generals. The constitution went too far in its anticlerical program, and its labor articles aroused passion on the left and vituperation on the right. Above all, the state did not have at its disposal a properly trained civil service, above politics, which might efficiently and without bias carry out the mandates of the government. But in spite of all these things the Republic might have survived had the deputies who were chosen to lead it been men of less passion and more common sense, men who were willing to place the common good above the welfare of the party.